In Windows 10, Microsoft PowerPoint of Office 2016, Office 2013, Office 2010 or most other versions cannot open, view or play the PowerPoint presentations (.ppt, .pptx and other file extensions), especially for PowerPoint documents that are saved in remote network location such as shared folders or network drive, or that were previously downloaded from email or Internet. In addition, PowerPoint files saved on local hard disk drive or synced through DropBox, Google Drive, OneDrive and etc. may or may not be opened successfully. Powerpoint found a problem with content in X:\Path\Filename.pptx. Sorry, Powerpoint cannot read X:\Path\Filename.pptx. 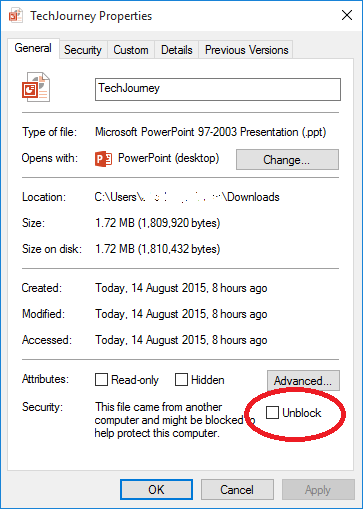 The issue seems to happen as Windows 10 and PowerPoint app try to protect and block suspicious files from been accessed or executed. Try the following fixes which can help to resolve the issue. Right click the affected PowerPoint presentation. Choose Properties from the the pop-up context menu. On the General tab, select (tick) the check box for Unblock at the bottom. Open the PowerPoint file again. Open Microsoft Office PowerPoint program. In PowerPoint Options dialog box, go to Trust Center, and click or tap on Trust Center Settings button in the right pane. Try to uninstall Microsoft Office and then reinstall Microsoft Office in Windows 10 may help to eliminate the problem. Then, you can try to open the PowerPoint presentations again.